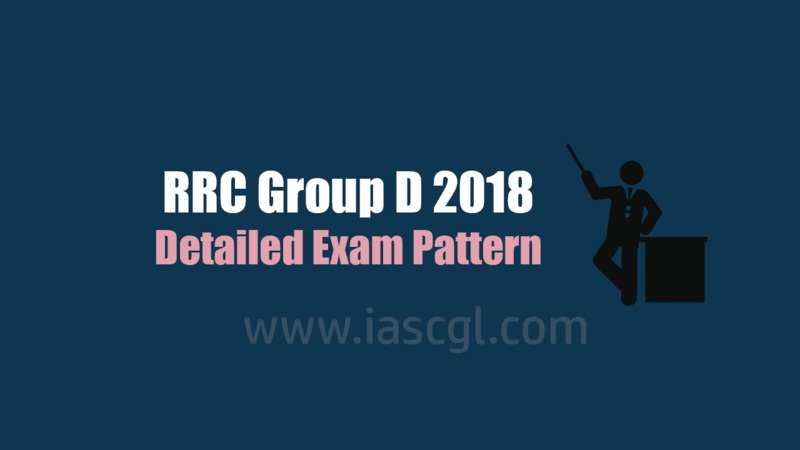 RECRUITMENT PROCESS Only single online application has to be submitted by the candidate to the RRB of their choice for all the notified posts of that RRB through the link provided on the official website. 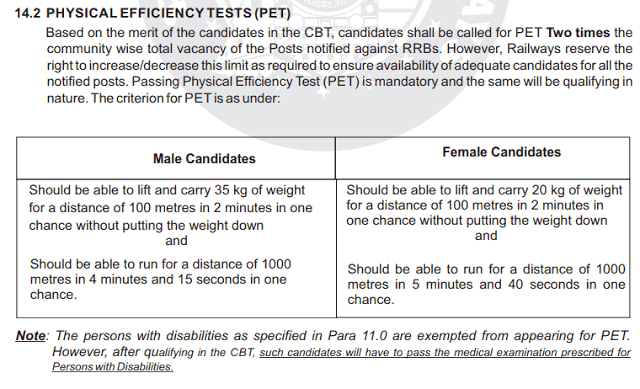 The date, time and venue for all the activities, namely, CBT, PET and DV or any other additional activity as applicable shall be fixed by the RRBs and shall be intimated to the eligible candidates in due course. Request for postponement of any of the above activity or for change of venue, date and shift will not be entertained under any circumstances. Minimum percentage of marks for eligibility in various categories: UR -40%, OBC-30%, SC-30%, ST30%. 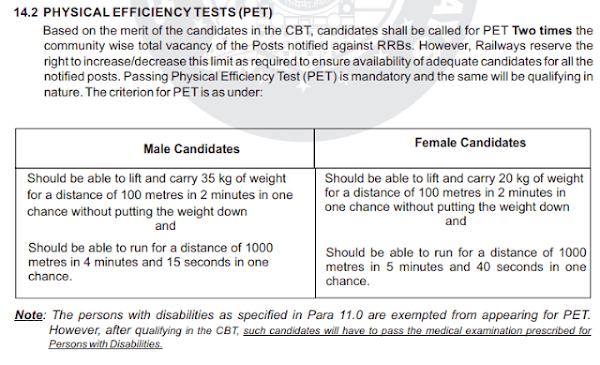 These percentage of marks for eligibility may be relaxed by 2% for PWD candidates in case of shortage of PWD candidates against vacancies reserved for them. a. Mathematics Number system, BODMAS, Decimals, Fractions, LCM, HCF, Ratio and Proportion, Percentages, Mensuration, Time and Work; Time and Distance, Simple and Compound Interest, Profit and Loss, Algebra, Geometry and Trigonometry, Elementary Statistics, Square root, Age Calculations, Calendar & Clock, Pipes & Cistern etc. b. General Intelligence and reasoning Analogies, Alphabetical and Number Series, Coding and Decoding, Mathematical operations, Relationships, Syllogism, Jumbling, Venn Diagram, Data Interpretation and Sufficiency, Conclusions and Decision making, Similarities and Differences, Analytical Reasoning, Classification, Directions, Statement – Arguments and Assumptions etc. c. General Science Physics, Chemistry, Life Science of 10th Standard. d. General Awareness on current affairs in Science & Technology, Sports, Culture, Personalities, Economics, Politics and any other subjects of importance.